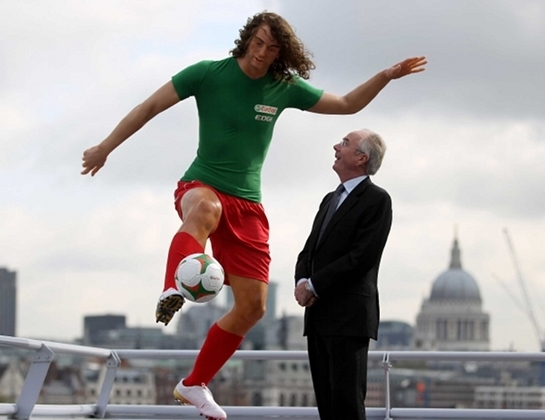 With the unmistakable hair of Carles Puyol, the eyes of Xavi, Lionel Messi’s dynamic left foot and the accuracy of Thierry Henry’s right, the explosive legs of Cristiano Ronaldo and the imposing height of Peter Crouch, the Ultimate Performing Player may look a little odd, but can boast a transfer value of over £270million! The model will now go on a world-wide tour where he will meet football fans in South America, the Middle East, India and South Africa for the 2010 FIFA World Cup. In the mean time, check out the video above to see legends of the game Alan Shearer and Marcel Desailly talk about the Ultimate Performing Player, hear what fans think and see how he was made!